The gorgeous white lines found throughout Chip and Jeannie Goodwin’s home near Pocahontas Point are their haven amongst life’s craziness. This summer home is a retreat for their family of four, located alongside the blue waters of West Lake Okoboji. However, the building didn’t start this way. In fact, in the fall of 2017, the property was in need of a major facelift. The couple looked at a variety of homes around the lake, but also wanted a place protected from the wind. 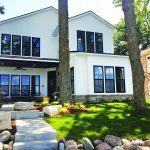 Goodwin’s hired Dan and Derek Lee of Lee Custom Homes to remodel the summer residence located along Okoboji Boulevard. Initially, the plan was to remodel the existing home, until they realized there wasn’t a solid foundation. During the fall of 2017, the walls were torn down and the existing plan was used as a footprint. The framing was put up in November, and the home was completed by Memorial Weekend 2018. Another complication was the close proximity to nearby properties. The crew had no ability to move in any machinery on the east side of the home. Delivery trucks also had to creatively back in and out along the dead end street. 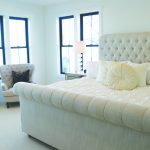 Jeannie desired a home with a contemporary look. She wanted the space to be welcoming and open. Her focal point was the kitchen, as this is a place where she wanted people to gather. Chip’s focus was the creation of a patio where he could relax, at times work, and enjoy the outdoors. Dan and Derek took their ideas and worked within the parameters of the home. At times, they added their own suggestions. For instance, they recommended turning the island and the staircase to their current directions. The home is 2,800 square feet and has four bedrooms and 3.5 bathrooms. There are barn doors in several places throughout the home, which Jeannie loves. When open, they contribute to the open concept. Chip also loves the openness and how the main areas focus on the lake. There are large windows facing the lake in the kitchen and living room, with doors walking out to the patio. 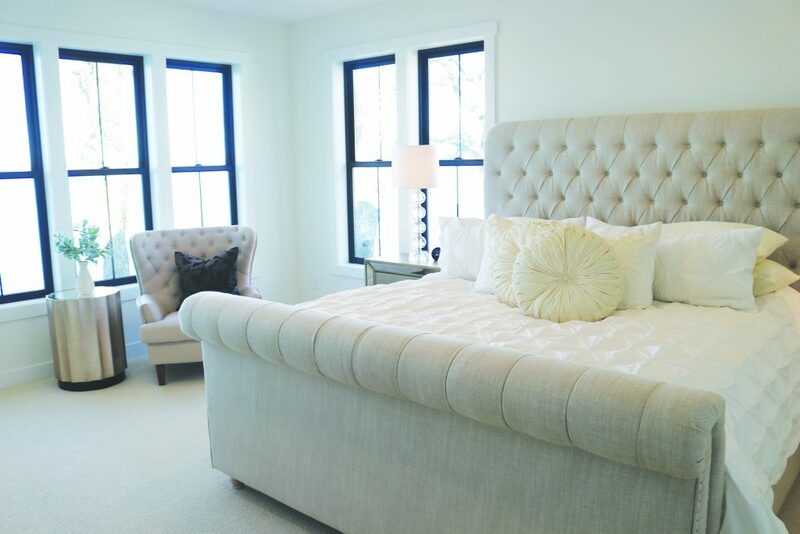 Upstairs in the master bedroom and bath, both rooms face the gorgeous blue waters of West Lake. The entire home is filled with big windows, flooding the rooms with bright sunshine throughout the year. Throughout the residence, all of the materials were obtained from local vendors. The lumber, siding, roofing and millwork all came from Consumers Lumber in Spirit Lake. 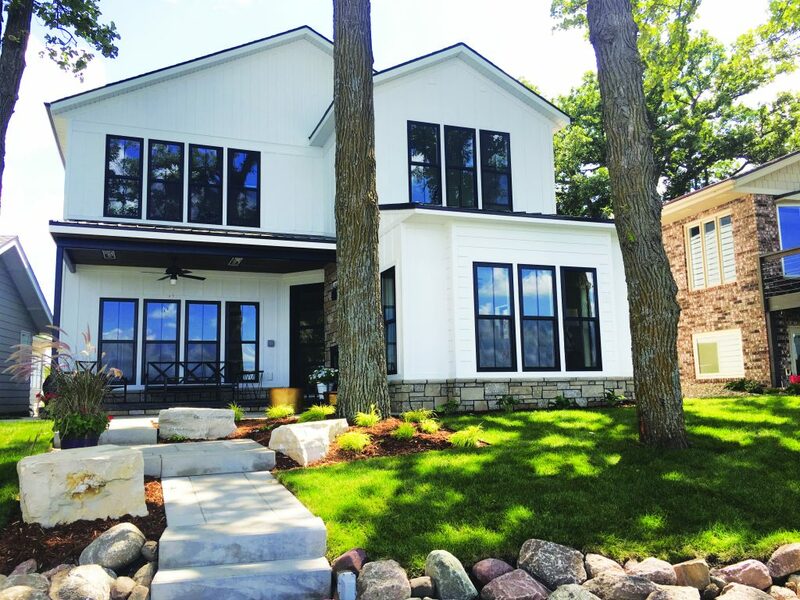 The windows are Andersen and were purchased from Cooperative Farmers Elevator (CFE) Lumber in Spirit Lake, while the Omega Kitchen Cabinets also came from CFE’s Home and Kitchen Design Studio in Okoboji. The hickory flooring throughout the home came from Okoboji Tile Shop and Mr B’s in Spencer. 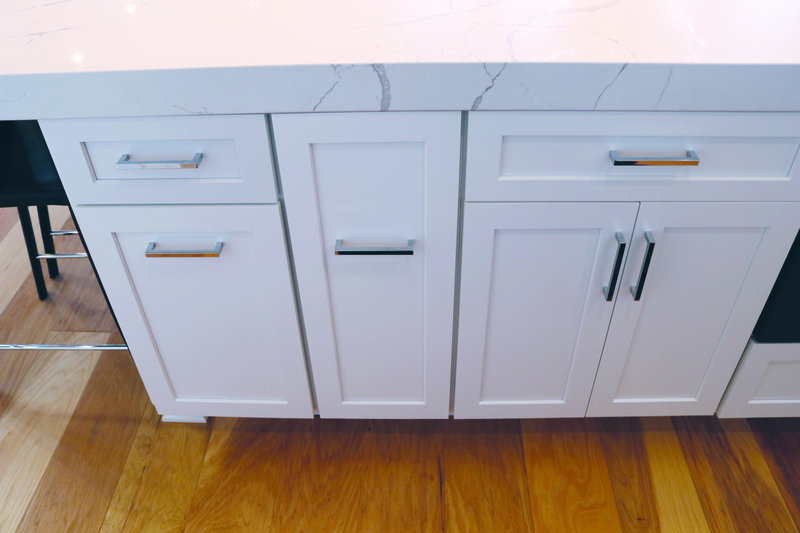 The gorgeous countertops are MSI quartz from Kruse’s Natural Stone in Spencer. 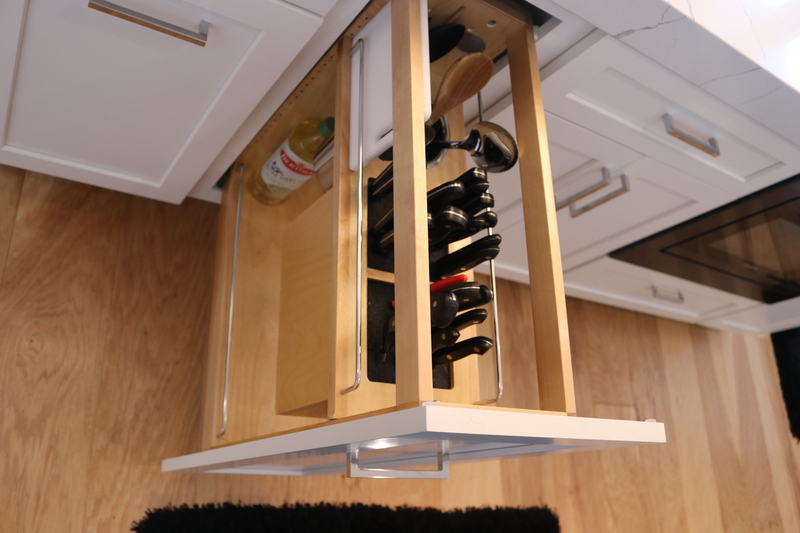 The kitchen centerpiece is the gorgeous MSI quartz island that draws people to the space. There is storage space from one end of the island to the other. While much of the house is in white, the kitchen has a blue/gray color backsplash. The backsplash runs the entire length of both walls, creating a homey feel within the open concept. Around the corner from the kitchen, a welcoming haven for guests awaits. On the ceiling, the uniqueness of the fan is a conversation starter. Along the wall, there is a hidden bar the Goodwin’s are glad they added. From there, easy access to the outdoor patio is available. Chip loves being able to relax along the lake. There are patio heaters and a TV above a two-sided fireplace. While the home will mainly be a summer residence for the Goodwin’s, they plan on enjoying it several weekends throughout the winter months. Chip and Jeannie also want it to be a haven for their daughters, Haley and Riley. Dan and Derek Lee started Lee Custom Homes during the summer of 2014. 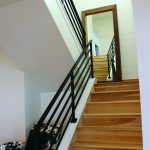 Their first project together was a spec home in Country Acres Estates. From there, they have established their business and are known for their high quality detail work. Prior to Lee Custom Homes, Dan was doing construction and remodeling from Storm Lake to Sioux City. Derek worked in commercial real estate in Minneapolis. The brothers combined their strengths and oversee different aspects of a home build. Dan enjoys the building and custom finish work—the more creative and detailed the better. He supervises the crews and is focused on day-to-day project management and running the job sites. While Dan is very hands-on with the construction work, Derek enjoys helping the homeowners with the floor plan and home design. “We can do some really neat things with 3D models now, so our clients can really get a feel for their new home before we start building,” he said. Derek is the Vice President for the Home Builders Association of NW Iowa. 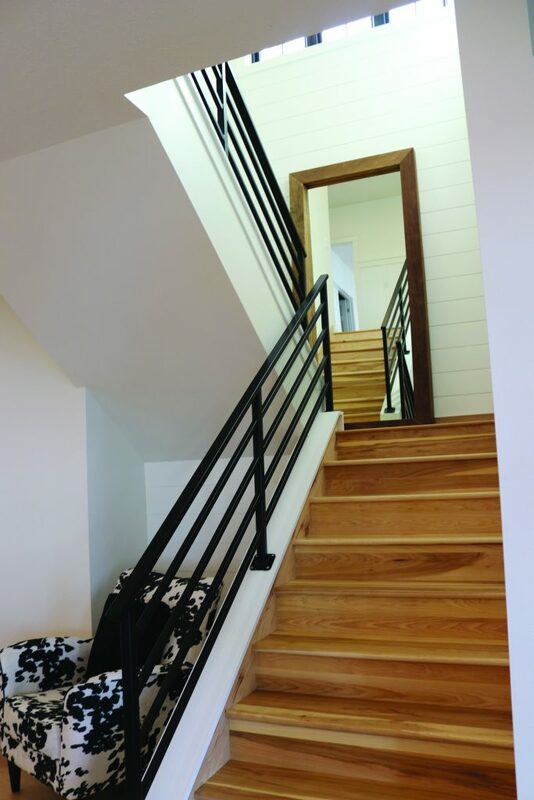 Lee Custom Homes focus ranges from new construction building to renovation projects, handling all aspects of the job, from the designing to the building. For more information, contact Dan and Derek Lee at (712) 339-1997. The Goodwin's are so thankful how these brothers took their ideas and transformed them into reality. For the Lee's, while the Goodwin's started as customer's they developed a great relationship and now are great friends.